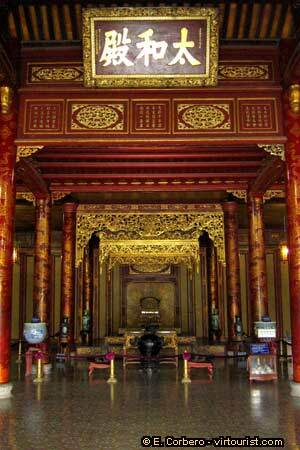 In the Royal Palace visitors can see the the thrones of the emperors in the Nguyen Dynasty. The visit to the Hue Citadel will take you several hours. It is recommended coming first thing in the morning, and leaving before lunch. You should also visit the place after sunset. The area of the Citadel is well illuminated. To get to the Citadel you can hire a taxi, take a cyclo and/or a motorbike taxi. For solo travelers, I recommend the mototaxi (if you are visiting Vietnam, you will have to get used to this public transport). For groups of two or more, I recommend the taxi. For couples, I recommend the Cyclos. Cyclos are bicycle taxis. Similar to the Thai Tuc-Tucs, but without engine. You sit on a chair, and a local guy that sits behind you pedals.